Duralex SUN MASTER ROOF & TRIM is a tough 100% Acrylic house paint specially formulated to protect against the harsh Australian climate. As well as containing Zinc Oxide and other U.V. blockouts, it is better able to expand with heat and contract with cold, than ordinary paints. Weatherboard, timber, pergolas, picket fences, rails, plasterboard, particleboard, MDF, PVC guttering and downpipes, galvanised iron and other rust resisting metals. It is not recommended for contact surfaces such as windows, doors or trim, furniture, shelves or raw wrought iron. 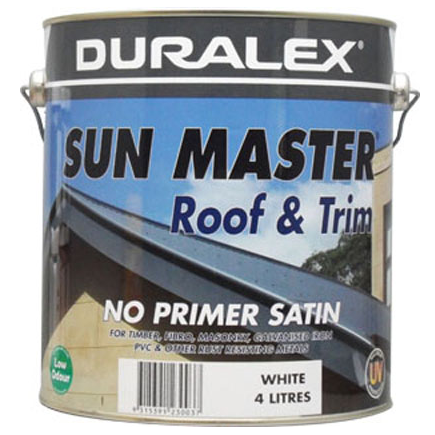 These are best painted with turps-thinned enamel or Duralex TRIM MASTER ACRYLIC ENAMEL. Available in 20 of the latest roofing colours. Sizes 10 Litres and 4 Litres. 15 Litre and 20 Litre are available on request. Coverage Up to 14m² per litre per coat. Ventilation Allow adequate interior cross ventilation during and after use to dissipate water vapour. Clean Up Do not pour leftover paint down the drain. Wash all equipment with clean water. Any dried spots may be removed using methylated spirits and a clean cloth.